As some of you may know I do a lot of sketching. 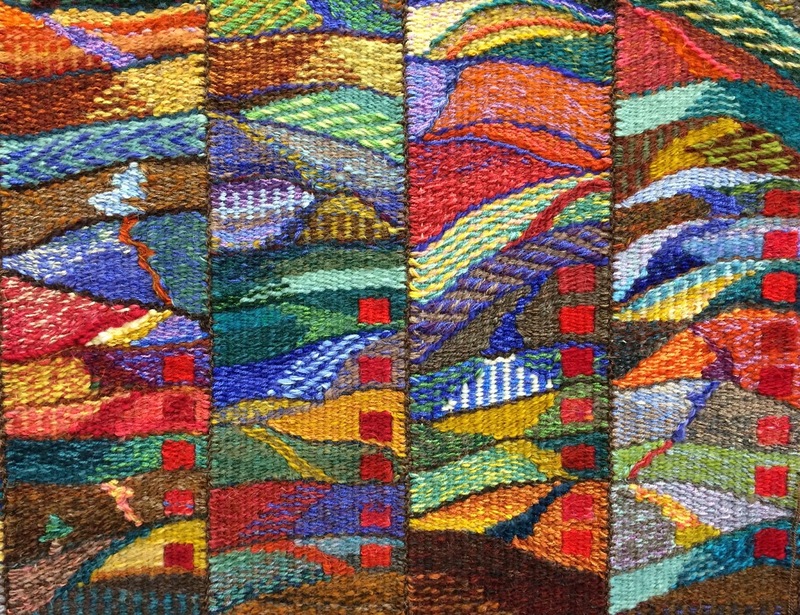 It keeps me connected to the world in a special way and nourishes all the other work going on in my studio, like tapestry for example. 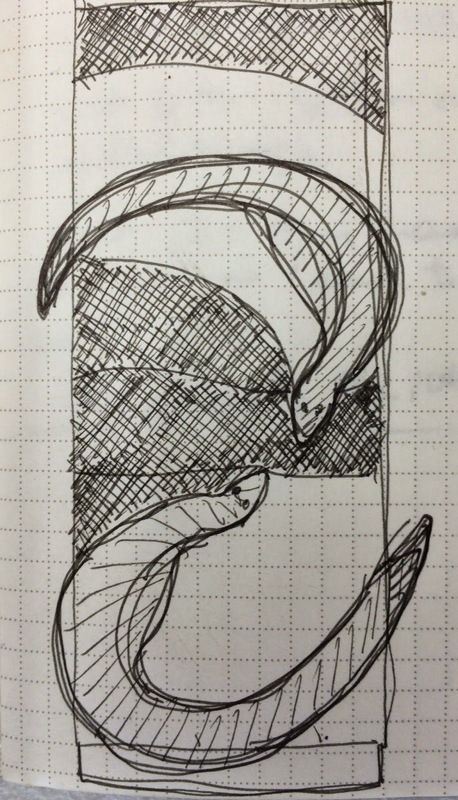 Thought you might like to see the very beginnings of this years tapestry diary; a rough sketch in my current tapestry notebook. It seems that thinking for the next years effort starts to happen around the middle of the preceding year. At this point and thinking of the efforts of the past couple of years it is easiest to consider them as a series. 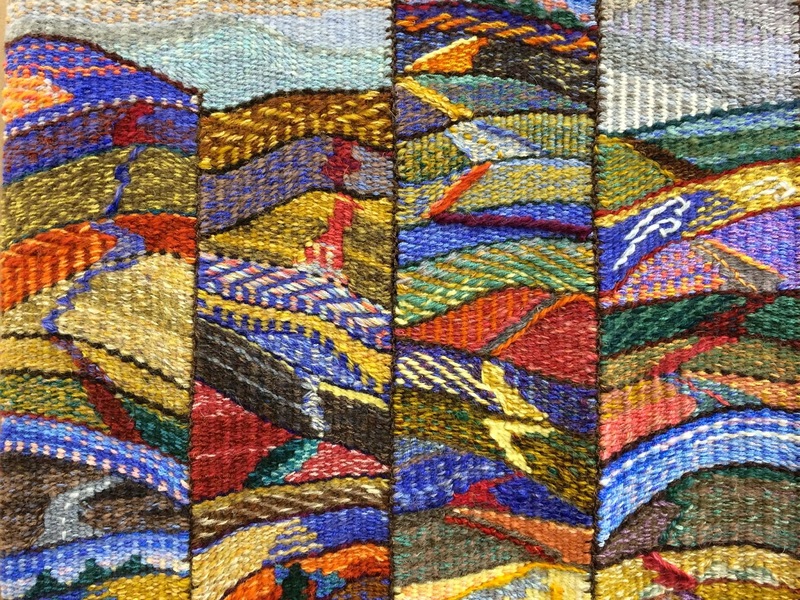 At first my emphasis was on technique and more importantly learning how to express myself through the technique of tapestry weaving. 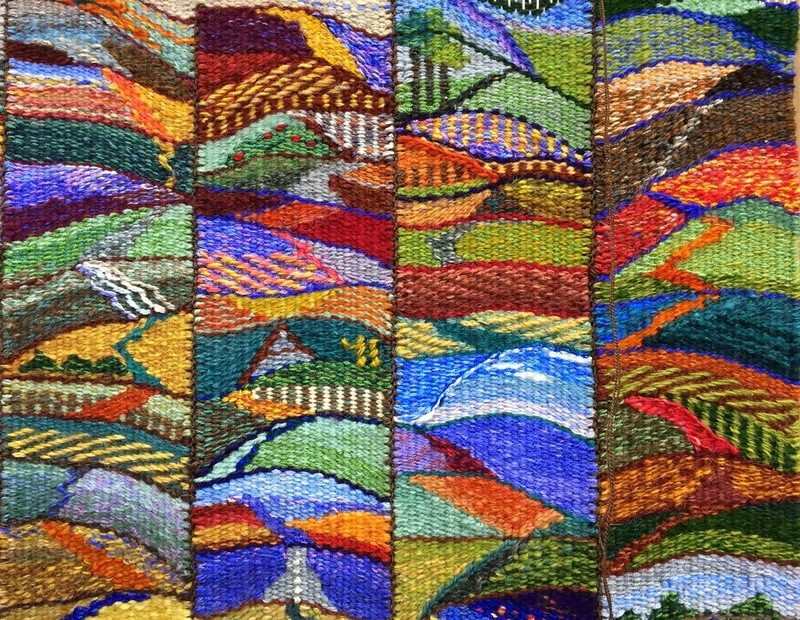 Here is the 2014 tapestry diary or daily practice as of yesterday afternoon. 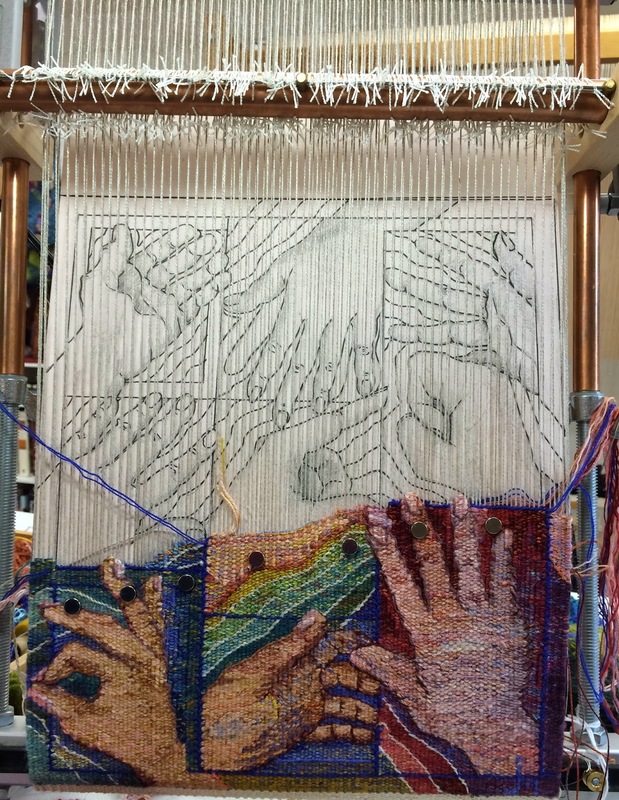 At this point I am giving some thought about how the daily practice differs from other types of tapestry work and what I can bring to it for next year. 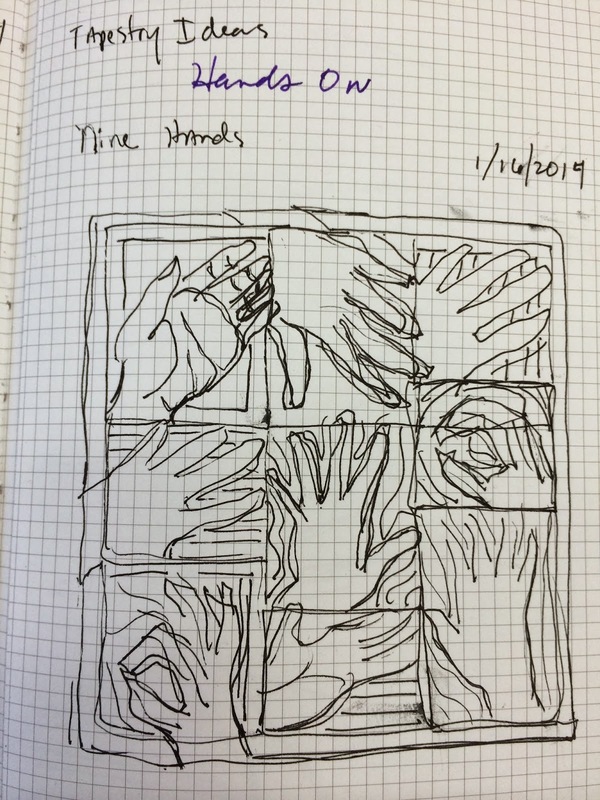 The daily practice can be read very much like a cartoon, each little frame is a point in time and together they form a narrative which happens in time. My daily practice is of course my narrative and to some extent I can determine the way it is read just as all pictorial design can be manipulated with the design elements. So I am continuing to think about my daily practice as a journey that can be read visually as a personal narrative, or cartoon of my life. It is a lot to think about! Here is a detail of the top left corner of this years diary where I have started to add the border of pale colors which will tie together the columns of the various months. My intention is to be working on this steadily so that at the end of the year I can move on to 2015 in a timely manner. 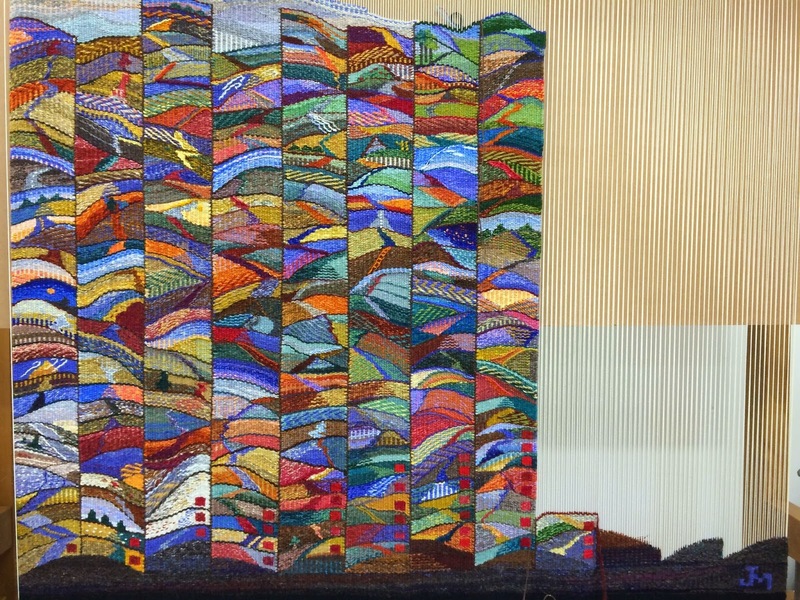 One of the interesting things about this years tapestry is that it grows in two different directions at once, it grows up from the bottom as all tapestries do but it also grows from side to side. Using the squares as a symbol for the beginning of each month helps to establish the order of reading the narrative which is quite different from the normal "reading" mode which travels from top to bottom and left to right. It occurs to me that within this framework the symbols for the months can establish different ways of reading my cartoon narrative. Here is another detail of a piece of 2014. I have used eccentric weaving this year and I really like the effect as it does lend motion and direction to the way the story is read. My thinking is that I would like to employ this idea again next year. This is a rough sketch of my idea for next year but I have already reconsidered a few things since making this sketch. For next year, still thinking of a journey through the days symbolized by moving over a landscape or terrain, perhaps a more challenging journey next year and rougher terrain. Also considering letting the months read alternately from left to right and right to left. 2015 may be a journey with an incline! 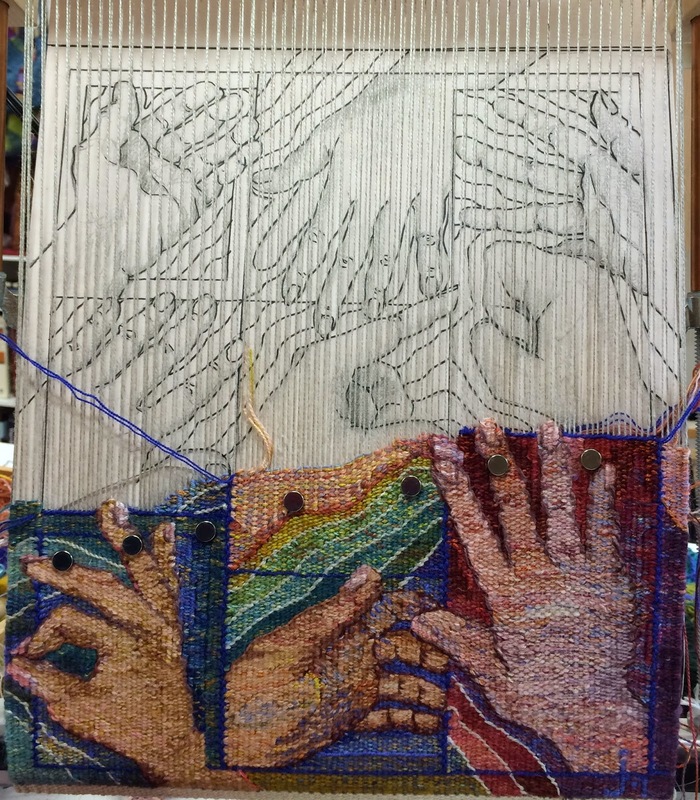 Speaking of sketchy stuff here is my first rough sketch for the Hands On tapestry. 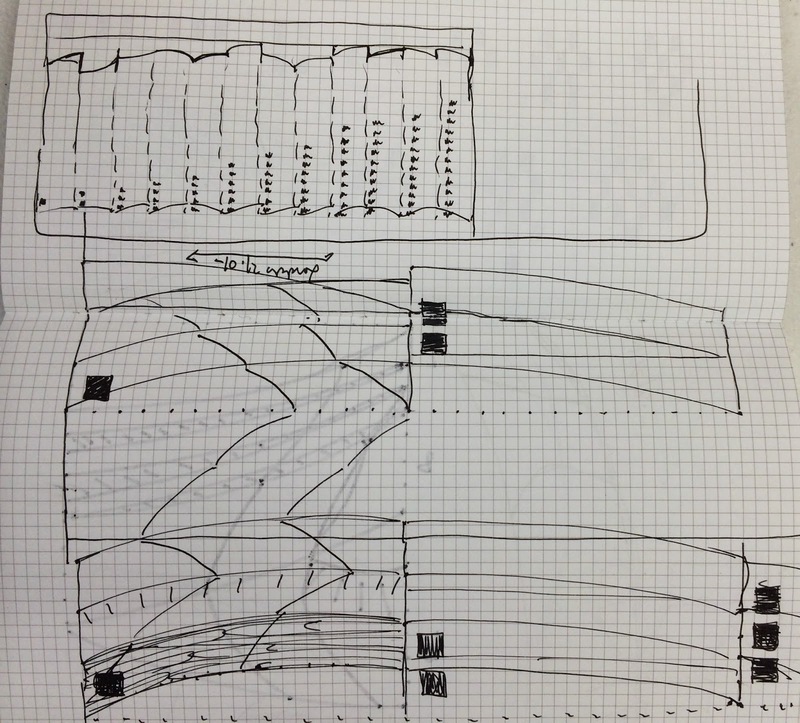 All my tapestry sketches end up in notebooks and very thumbnail in approach. I think it is because the materials of tapestry are so sensuous that I don't want the sketches to compete, they are just an idea of the slightest kind put on paper. The real work will happen with wool, silk cotton and linen! Here is a photo of the "Hands" as of today. I am happy to be able to say that it is making some progress and finding a voice. There is much more linen and silk in this one than any of the others I have done and while I am not exposing warps the linen warp is also being used as weft in the tapestry. A little closer view with some of the background eliminated. It is coming along. 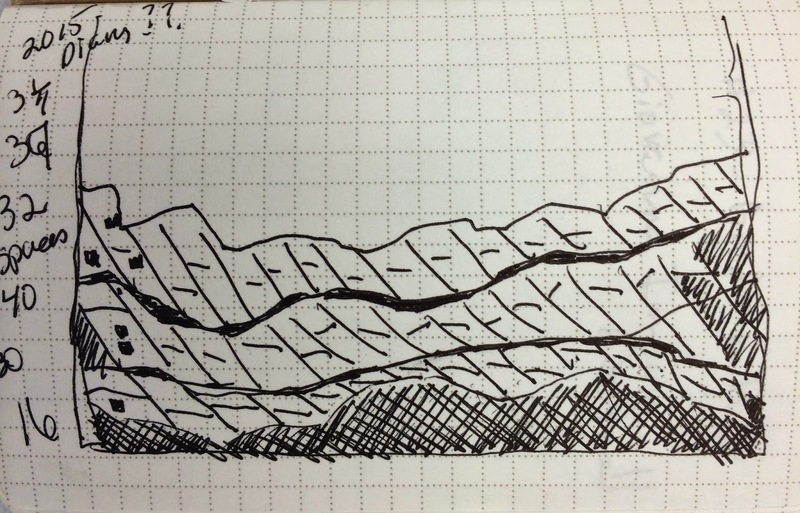 A few more sketches done in my tapestry notebook from the ATA retreat, July 2014 in Providence, Rhode island. and so is this one. 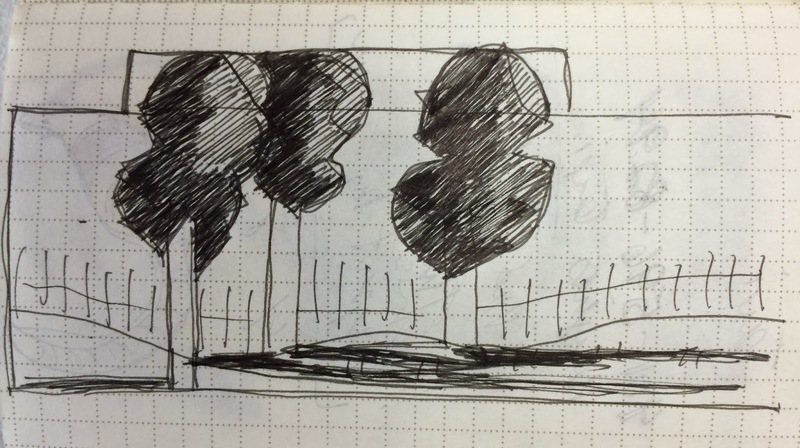 I was trying to work out an idea for my extended warp sample and ended up working with the trees above. 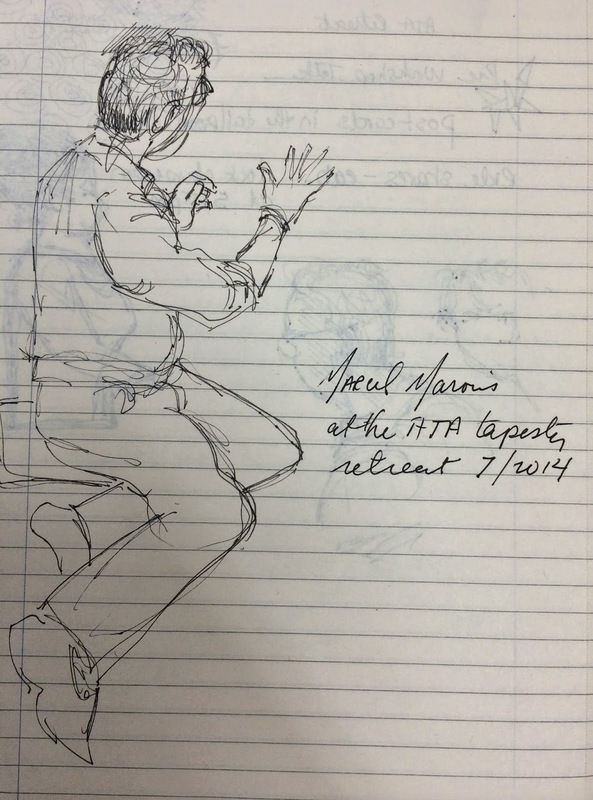 Here is a little sketch of Marcel Marois while he was giving an introductory lecture at the same retreat. I was impressed with how expressive his body language was. It was easy to read how passionate he is about tapestry even if you couldn't hear what he was saying. Fortunately I was able to enjoy both! I have had my head and body in my work the last couple of weeks and sometimes it is hard to transition from doing the work to talking about it. 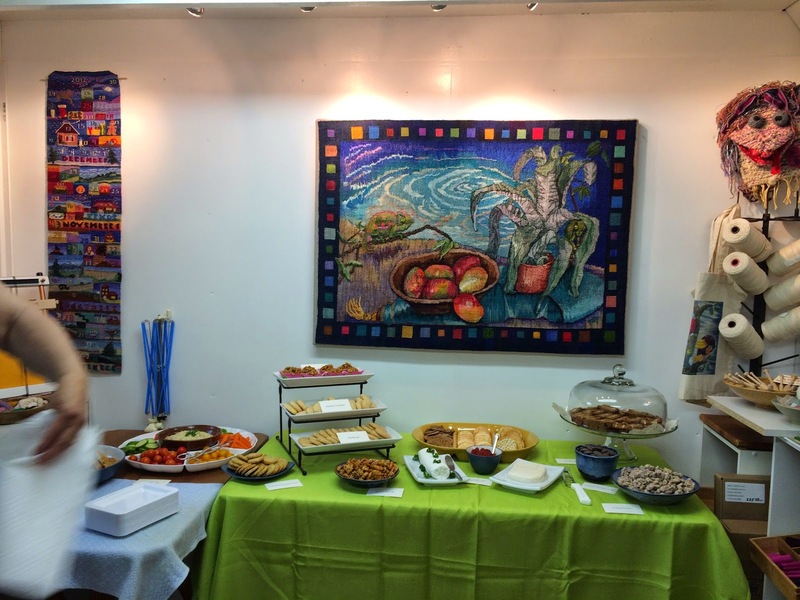 Hoped to have lots of pictures from a studio party I gave a while ago and this one picture of the lovely food that my friend Janet Kozusko made for the event is all I have. 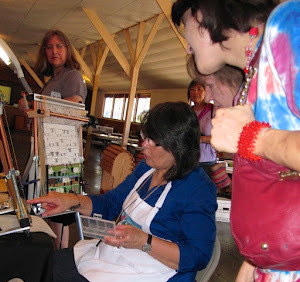 The transition from taking pictures and observing an event to participating in the event is also difficult to make. Obviously I made the transition to participant at this event and the picture taking was all but forgotten until after it was over. Pretty sure we all had a good time though. Many thanks for sharing this wonderful inspiration! I'm so glad to hear that you enjoyed it Jennifer.